Fountain Pen Day has its own Facebook Event Page. Apparently it’s quite a big deal. 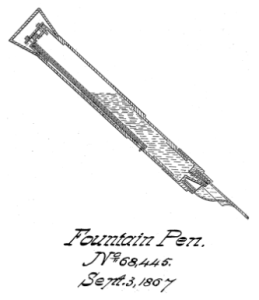 Pens with reservoirs have been available since the 17th century, but the process of developing a reliable pen was slow-going. The role that air-pressure played in the operation of ink-filled pens wasn’t well understood, so it took until the mid-19th century for the invention of a pen that could withstand the highly corrosive ink. Many patents were issued in the mid-19th century to various inventors. By the late 19th century, fountain pens had become common place, effective, and beautiful writing implements because of three key inventions: iridium-tipped gold nib, hard rubber, and free-flowing ink. Victorian-era inventors fought to overcome the challenges of leakage, sediments in ink, the corrosive nature of inks, and the messy procedure of refilling by means of an eyedropper. The Industrial Revolution was in full-swing and eventually methods of mass production were perfected, allowing for reduction in costs and the reduction of prices. The invention of a new machine made the mass production of cheap, robust steel pen nibs possible, thus making pens available to those who previously could not afford to write. This boon is credited with encouraging the development of education and literacy. Why are fountain pens popular now? Fountain pens seem hopelessly geeky to the uninitiated. Why bother with an expensive, finicky pen when most of us do all of our writing on keyboards and touchscreens anyway? And what’s wrong with a ballpoint? They’re apparently cool. Or hot. Whichever term currently means stylish and hip and contemporary. 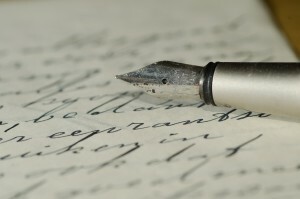 Last March Ed Jelley argued 8 Reasons Why You Should Write With a Fountain Pen. My favorite one: improved penmanship. As an author of historical romance, I often find myself immersed in census records (and others) from the 19th century, researching everything from occupations to names actually given babies in certain eras and regions of the country to taxes paid or values affixed to property and reasons doctors gave for deaths. I’ve had to work at deciphering 19th-century handwriting. It’s not as easy as it might seem. 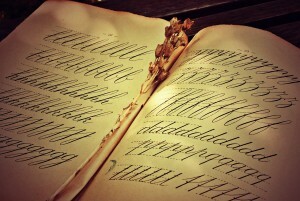 Some resources have made it easier, such as the Spencerian Penmanship books. Spencerian Script is a script (or penmanship) style used in the United States from approximately 1850 to 1925 and was considered the American standard for business correspondence prior to the widespread adoption of the typewriter. Spencer’s Book on Penmanship was published in 1866. The image, below, is a surviving sample of Spencerian penmanship. It’s gorgeous and reminds me of the pristine form of my grandmother’s and grandfather’s handwriting. 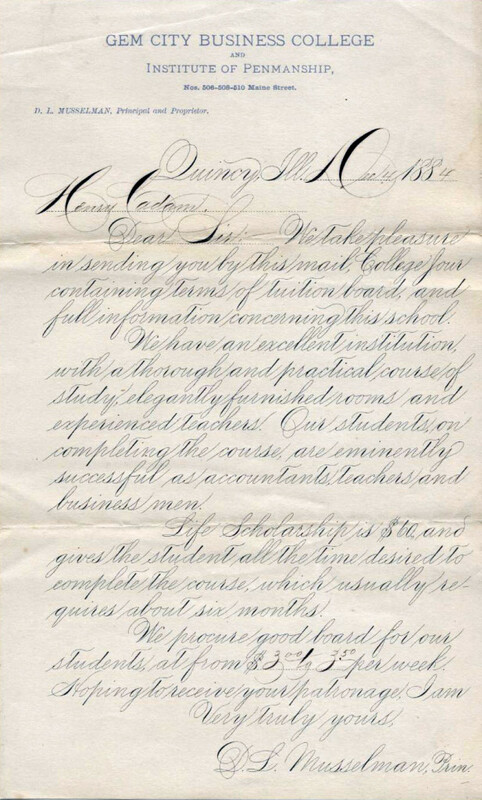 Penmanship of this quality seems to be something of a bygone era, achieved by and large by a focus in education and by the writing implement itself. Notice the heavier strokes noted in the D in Dec (top line) and the lower curve of the S in “Dear Sir”, accomplished by the flexible nature of the fountain pen’s nib. 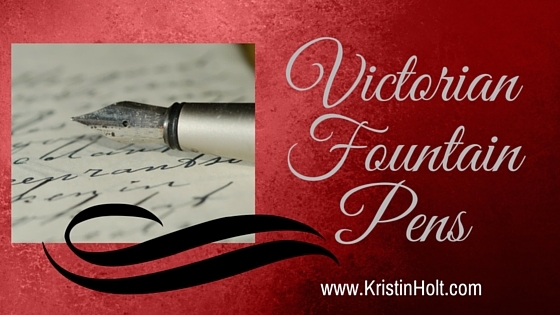 Perhaps there are solid reasons– beyond fondness for all things Victorian– to enjoy fountain pens… and to set aside one day each year (November 6th) as Fountain Pen Day. 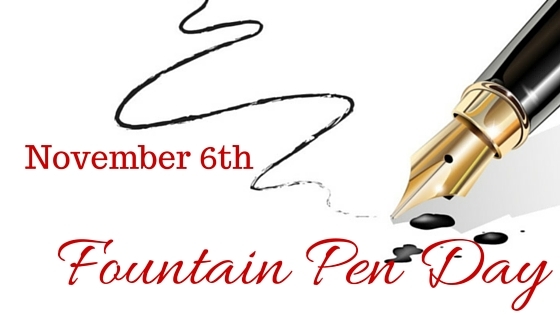 I’m so fond of fountain pens, Spencerian script, and quality penmanship, that my guests at the first-ever Salt Lake City Readers Luncheon, tomorrow, will find a fountain pen and a Spencerian Copybook (practice book) within their gift bag from me. 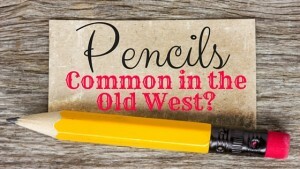 Read Related Post– Pencils: Common in the Old West? A nice article. I was looking at some history for the fountain pens and this one portrayed an impression. Thanks for stopping by, Royaline, and for sharing your interest in fountain pens. Thanks for your kind comments.